Aquasana believes clean water and a healthy environment are the most important components to healthy living and overall well-being. Their sole focus is providing best-in-class water filtration products so every home can enjoy great-tasting, healthy water. 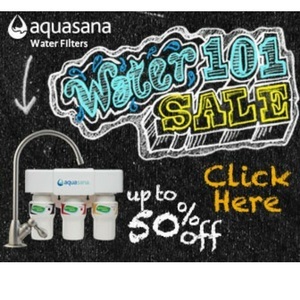 Aquasana Drinking Water Filters use best-in-class filtering technology to provide maximum reduction in water contaminants while leaving beneficial minerals such as calcium, magnesium and potassium in the water. Their drinking water filters are NSF Certified to reduce 66 common water contaminants including over 96% of chlorine and chloramines as well as over 99% of lead, asbestos, turbidity and VOCs.